The Kelly Clarkson of Cheesecakes. Kelly Clarkson has probably been chomping down on this. That’s why her fingers are so chubby. You’re probably confused about the title. This is actually about a New York cheesecake. 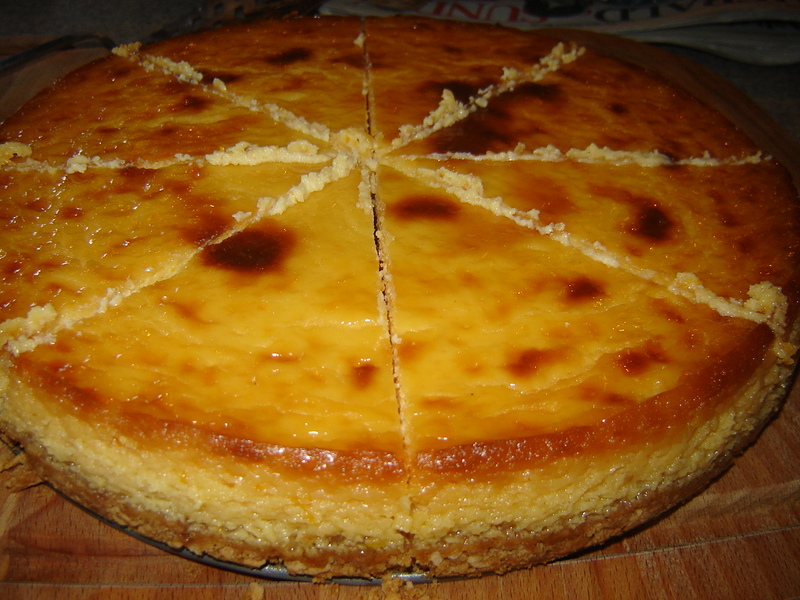 It is seen as one of the original flavours of cheesecake. Kelly Clarkson is, of course, the original American Idol. I probably could have come up with a better analogy if my brain decided to work, but I was watching American Idol at the time. Don’t judge me. I made this flavoursome diddy for Mother’s Day (let me hear you all say “Awwww”.) We had an afternoon tea for my Gran, in which my Granddad was also invited and which my Mother got to enjoy too. 250g plain sweet biscuits, 125g butter melted. Filling: 750g cream cheese softened, 2 teaspoons finely grated orange rind, 1 teaspoon finely grated lemon rind, 1 cup (220g) caster sugar, 3 eggs, 3/4 cup (180g) sour cream, 1/4 cup (60ml) lemon juice. 1. Process biscuits until fine. Add butter, process until combined. Press mixture over base of 24cm springform tin. Refrigerate 30 minutes. 2. Preheat oven to 180°C/160°C fan-forced. 3. Make filling by beating cheese, rinds and sugar in medium bowl with electric mixer until smooth. Beat in eggs, one at a time, then cream and juice. 4. Pour filling into tin; bake 1 1/4 hours. Turn oven off and leave to cool in oven. 5. Refrigerate 3 hours or overnight. Make sure you pull the cream cheese out of the fridge about half and hour before you intend to beat it together with the other ingredients. By doing this it softens and makes it a lot easier to beat. For the base I usually use 2 tablespoons of margarine and 2 tablespoons of apple purée instead of butter. The base tends to stick together a lot better instead of being crumbly and it is healthier than the multitudes of butter. Just say: I’m making your devilish desserts healthier one step at a time… Also, use light cream cheese (even better!) These changes do not make a difference in the taste, if you were wondering. In cooling the cheesecake in the oven, I leave it in the hot oven (turned off) over night. So the oven and cheesecake cool down together. This makes it set a lot better and creates a more creamy texture. This type of cheesecake you really do need to make the day before you need it. And, it was tasty tasty. Everyone enjoyed it. I got a thumbs-up from my brother-in-law. Win!